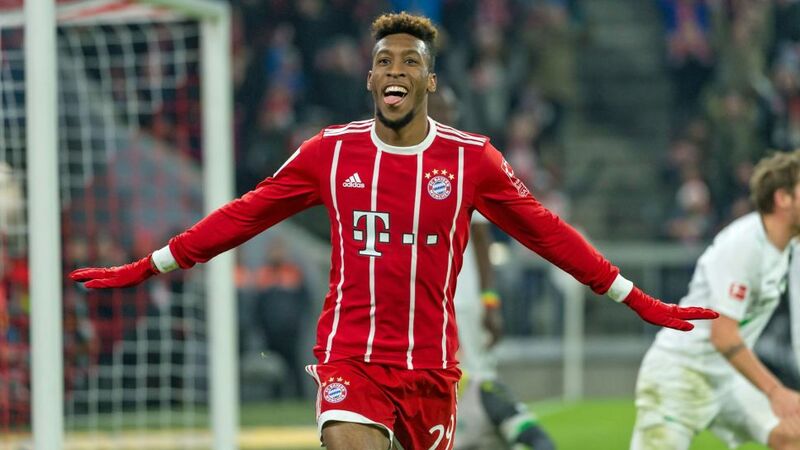 France winger Kingsley Coman will be looking to help Bayern Munich get one over on his former side Paris Saint-Germain on Tuesday after a sensational performance against Hannover on Matchday 14. The sight of a Frenchman skipping down the wing, tearing through opposition defences and delivering emotion-inducing touches of class is nothing new to Bayern fans. For over a decade, Franck Ribery has been wowing the crowd at the Allianz Arena with his show-stopping skills, dribbles and inventions. On the day that the 34-year-old marked his return from injury, and etched his name in the history books as Bayern's leading appearance maker for a foreign player, it was another Frenchman, however, who was taking the plaudits - the man he replaced. Kingsley Coman left the field to a standing ovation. It was indecipherable whether the cheers were in recognition of his performance or in anticipation of Ribery's return. It was probably both, after the Allianz Arena faithful paid tribute to their new French fantasista's match-winning performance. "He was outstanding," said Bayern coach Jupp Heynckes, lavishing praise on the former Paris Saint-Germain and Juventus winger. "It's delightful to see how he's developed here." Ribery was equally excited about a man 13 years his junior who could well deprive him of some of the action, and is already being tipped to challenge his 235-appearance record for the Bavarians. "He did a great job," he said after celebrating his comeback from injury. There were certainly shades of Ribery in Coman's wing wizardry, as he terrorised Hannover full-back Julian Korb, hit the mark with 93 per cent of his attempted passes, scored and earned the penalty which Robert Lewandowski put away to seal victory. "When he gets his head down and starts sprinting, it's hard for anybody to keep up with him," said Bayern right-back Joshua Kimmich. "I know that myself from training. He's also improved in his link-up play, his crossing and shooting, and the first touch for his goal was amazing." His second touch was not bad either as he blasted Bayern in front as they bounced back from defeat at Borussia Mönchengladbach a week ago by opening up a sizeable advantage at the top of the Bundesliga, with Leipzig and Schalke dropping points behind them. "We know that Kingsley has extraordinary skills that aren't easy to find," said Thomas Müller, another Bayern player who seems rejuvenated under Jupp Heynckes. "If he puts his foot on the gas – and he has incredible horsepower – every opponent has a tough time against him. He worked the left flank well. He's always been fleet-footed. If he can now add chances that lead to goals then he's pure gold to us."